Elizabeth Corwin, PhD, RN, associate dean for research at Emory's Nell Hodgson Woodruff School of Nursing received a five-year, $3.6 million grant from the National Institutes of Health to examine the neurobehavioral and cognitive effects of maternal stress and the microbiome on African-American infants. Corwin and her team will analyze biobehavioral data from an ongoing study of more than 400 pregnant African-American women during the first and second trimesters of their pregnancy through delivery. 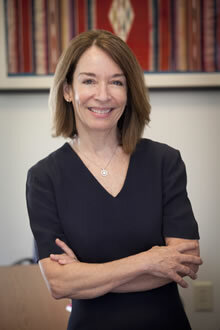 Based on information regarding socioeconomic status, and prenatal measures of maternal stress, microbiome composition and diversity, infections, and antibiotic exposure, as well as delivery method and gestational age, the researchers will seek to discover how chronic maternal stress and disadvantage affect the infant microbiome-gut brain axis. The microbiome-gut brain axis involves the biochemical communication that takes place between the brain and the microorganisms living within the gastrointestinal tract. It is believed that the microbiome modulates brain function, development, and behavior as well as the infant immune system and stress response. Corwin's research will investigate whether the composition of the maternal and infant gut microbiomes are linked to exposure to pre- and postnatal maternal stress and whether that composition contributes to the brain development and social-emotional outcomes for African-American infants ages birth to 18-months. "Because many factors that influence the microbiome are modifiable, the knowledge gained holds tremendous potential for promoting the health of the next generation of African-American families," says Corwin. Corwin's co-principal investigator on the award is Patricia Brennan, PhD, professor of psychology in Emory College.